If you write down the sequence and follow it, you won't miss a step and will save ton of time. I have been registering and launching domains regularly. 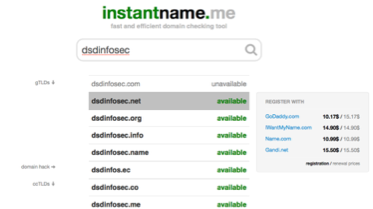 The first one I registered was my personal domain jjude.com, the latest one is for the company I started, DSD Infosec. With the experience of launching multiple domains, I have formulated a sequence in launching a site. Domain Name Search: Search for the domain name at Instantname. Instantname provides all the available names categorised by top level domains, domain hacks, regional level domains along with registration prices at different registrars. It is a great time saver since I can view all the required information in a single screen. If you are particular about short domain names, you can also use, domai.nr, though I have not used them. Domain Registration: I use Godaddy for all domain registration. For one site, I tried hover, but I transferred the site back to Godaddy, since I would like to have all sites with the same registrar. It makes it easy to monitor and renew sites. Website Hosting: I use Webfaction to host all my domains. Their hosting plan includes web hosting, db hosting and email servers. I have been their customer close to ten years now. Their hosting prices are competitive; but their customer service is beyond any comparison. It is the best. Email Ids: I create at least two email ids for all the domains. First one is the primary email id and the other one is exclusively for mailing lists. If I’m creating a website for an app, I may create a support mail id too. Webfaction has a concept of mapping multiple email ids to a single mailbox. So I may publish multiple email ids for a domain, but I have to check only one mail id, from within the mail client (Gmail, Apple mail, iOS mail). Cloudflare Optimisation: I use cloudflare to protect and accelerate all my sites. Once I include the domain in Cloudflare, I change the name servers in Godaddy. Social Media Handles: I use only twitter for social media presence. Sometimes, I don’t get a twitter handle of the exact name. Then I try appending ‘app’ to the name (suited if the handle is for an app, if the domain is for persons, you can try ’says’). While you are at twitter, create a twitter card too. I created a Facebook page only for this domain. Mailing List: Email is still the best marketing channel. I use mailchimp for managing the mailing list. Even for a blogger, mailing lists are useful. I get to know subscribers and then when I write a post, I visualise having a conversation with them. It helps me to get into writing flow. Web Analytics: I don’t obsess over analytics. I focus on what matters and ignore other parameters. I use Google Analytics; I used to use Statcounter, but recently I started using Clicky. I configure the analytics solution to email the reports. It saves me a lot of time. Landing page: I use bootstrap for creating landing pages. There are plenty of resources (templates, tips, code-snippets) available for bootstrap, so I can create a landing page quickly. Source control: Every code I write, including HTML & CSS, are pushed to source control. I have separate repository for each domains. Having site code in source-control has three benefits: I can clone an existing repository for a new site; I can track changes; and if I make a mistake, I can revert to an earlier working version. I use Bitbucket as a source control tool. I don’t launch domains every day. So having a sequence and writing that sequence helps me not to miss any step. It is also a saves me time, since I don’t have to keep revisiting the steps.